George Washington Slept Here. Really. George Washington didn’t like playing favorites. So when he went on two cross-country tours during his presidency — one through New England and the other through the South — he insisted on staying in public accommodations. “…I shall avoid giving umbrage to any,” he wrote his distant cousin, William Washington, “by declining all invitations of residence.” In those days, public accommodations generally meant taverns, and even the best of them were a far cry from the luxury hotels a modern-day president would expect. The fact that staying in them was his choice didn’t stop GW from grousing about the substandard housing he endured on his travels. Charleston, however, was one city that got it right. GW stopped there for a week on his Southern Tour in the spring of 1791. “The lodgings provided for me in this place were very good, being the furnished house of a Gentleman at present in the Country…,” he wrote in his diary. That gentleman was Thomas Heyward, a signer of the Declaration of Independence, and the house is now a museum called the Heyward-Washington House, owned by the Charleston Museum. The Georgian house, built in 1772, was the town home of Heyward, whose primary residence was White Hall Plantation, north of Charleston. 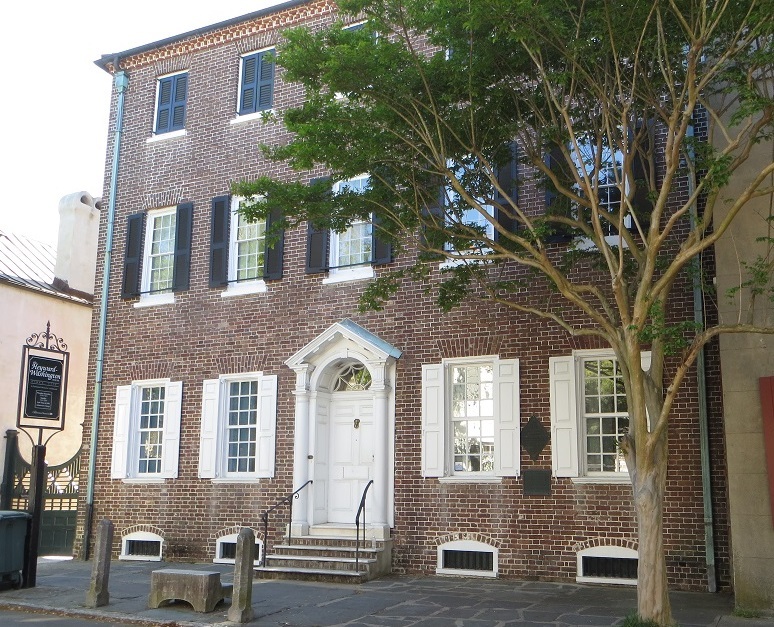 The Charleston city council rented the town house for a week for GW’s use, and threw in a housekeeper, several servants and provisions while they were at it. Only a few of the period pieces which fill the house are original to the Heywards and the guide — a particularly prepossessing young woman — pointed out the ones that were. 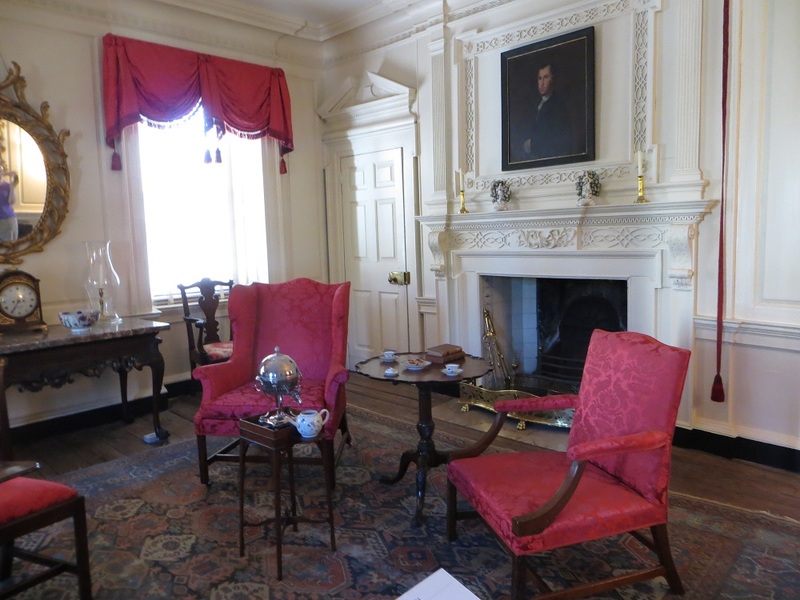 In one of the bedrooms, she said, “This was the master bedroom, so we’re guessing that this may have been where George Washington stayed. 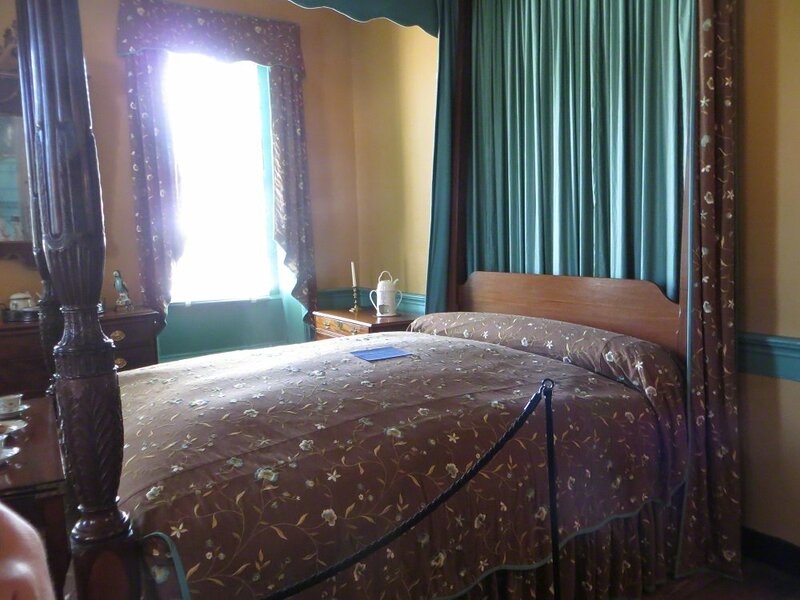 The bed belonged to the Heywards.” I asked if that meant that George Washington had slept in that bed. Possible, but not enough for the museum to make that connection, was the response. 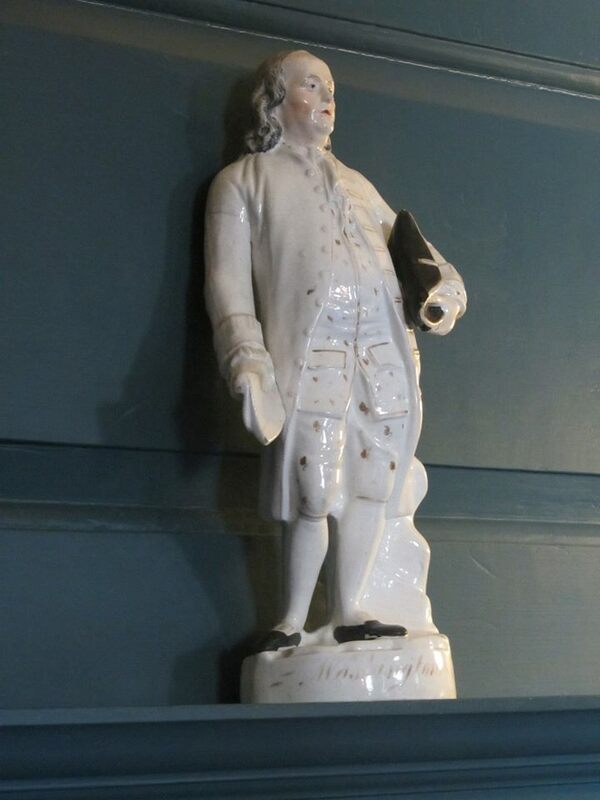 The other memorable story from the house was of a Staffordshire china figurine. “Clearly Benjamin Franklin, right?” said the guide. “But in 18th century Europe, few people knew what he looked like.” So when sales of the figurine dropped with Franklin’s popularity, she explained, merchandisers simply replaced his name with the more popular Washington’s. Explanation of this dissonance from other sources take a more charitable — that Europeans didn’t know one American from another and it was simply a mistake — but less interesting view. The Heyward-Washington House, like its Charleston Museum sibling, the Joseph Manigault House, allows visitors to take photos inside. I didn’t come across any other house museum in Charleston that allowed that. In 1794, Heyward sold the house to John Grimke, a fellow rice planter and father of abolitionists and suffragettes Sarah and Angeline. Sarah and Angeline are the subjects of a new novel by Sue Monk Kidd, called The Invention of Wings. I haven’t read it yet, but it’s on my list. Gallery | This entry was posted in South Carolina and tagged Charleston house museum, George Washington's Southern Tour, Heyward-Washington House, Southern Tour 1791. Bookmark the permalink. 12 Responses to George Washington Slept Here. Really. Good story – I like the China figurine explanation! I tend to be a skeptical, so I found the guide’s story very interesting. Especially in light of the fact that everyone else seems to give the manufacturers the benefit of the doubt. It was the first time out of the nest so he was going nowhere and it was easy to get the picture! George Washington was truly a president of the people. He did not belong to a political party which probably would not happen today. Also, the fact that he chose to stay in substandard housing is remarkable. Thanks for visiting! George Washington is my favorite founding father. I find him tremendously admirable — personifying hard work and integrity. And that he sometime got a little grumpy (to himself, in his diaries) makes him, for me, endearingly human. Oh my gosh, I had to reread that one. Initially I thought it meant all Americans looked alike to Europeans. 😛 Fun post, thank you! LOL — That’s not what I meant, but it actually might have worked that way. Stunning architecture, the woodwork here is phenomonal. I am pretty sure GW would not have been as impressed with his lodgings on his northern tour, but so far all I can find on it was written by the locals and has very little of his diary in it. He is a good choice for favorite FF. I am not sure the others made such personal sacrifice to complete their achievements. Charleston in general was just stuffed with gorgeous architecture.